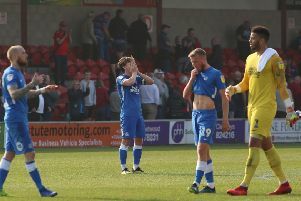 Posh star Marcus Maddison celebrates his goal against Millwall with team-mates Jack Baldwin (left) and Chris Forrester. My personal review of Peterborough United’s season will appear in Thursday’s (May 4) Peterborough Telegraph. Here are some stats from the 2016-17 season as well as some personal highlights/lowlights. Action from Posh's heaviest defeat of the season against Norwich City in the Checkatrade Trophy. Plus 7 by two goals. League 1 doubles (lost): 4 v Bradford C (0-1 & 0-1), Oxford (1-2 & 1-2), Fleetwood (1-2 & 0-2), Sheffield Utd (0-1 & 0-1). Longest winning run: 5 games: v Bristol Rovers (away), Chesham (home), Barnet (away), Bolton (home), Northampton (away). Longest unbeaten run: 6 games: v Chesterfield (home), Charlton (away), Notts County (home), Gillingham (home), Coventry (home), Scunthorpe (away). Longest losing run: 3 games v Millwall (away), Bradford City (away), Oxford (home). Longest run without a win: 8 games v Norwich (home), Swindon (home), Port Vale (home), Sheff Utd (away), Walsall (home), Shrewsbury (away), Southend (away), MK Dons (home).